INT RASTER D.O.O. 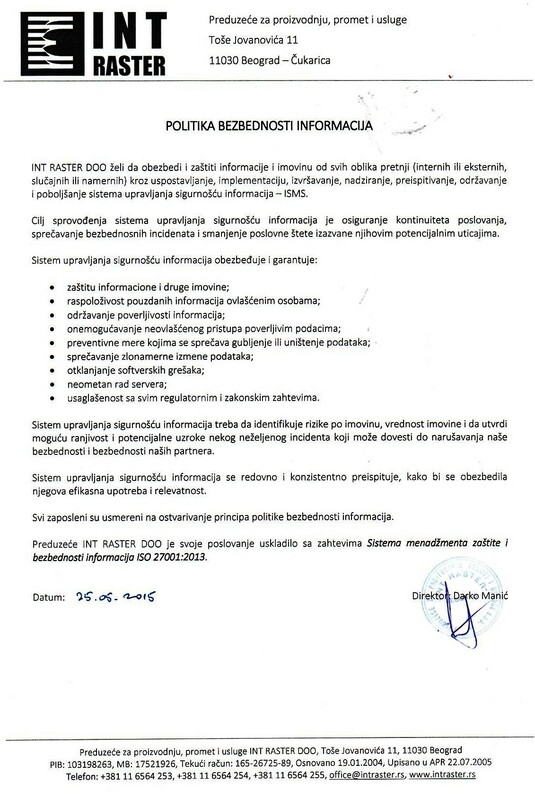 Beograd je deo DATECS Ltd. kompanije (Sofija, Bugarska) od 2012.godine. The start was given in 1990 with the first Cyrillic fonts in the Post Script format, the first Laser printer with in - built Cyrillic fonts in 1991 and the first professional program for complete Cyrillic support under MS Windows - the Flex Type - in 1992. During 1996, this product was accepted as the standard for the communication software products, employed to serve the Council for European Security and Cooperation. In 1997, Microsoft purchased a Datecs license for the distribution of the spelling and hyphenation product - Flex Word. In cooperation with Samsung, Datecs embarked on developing retail systems in 1994. Two, Samsung based, electronic cash registers were reconstructed in order to expand their functions and adapt them for networking. The company produced its first electronic cash register - the Datecs MP500 - in 1996, followed by the model with the thermal printer, the MP500T, a year later. In only a few years - and 100 000 devices sold in 11 countries around the World - Datecs became the best known brand of electronic cash registers with fiscal memory in Central and Eastern Europe. The novel concept of employing the PC as a server in a network of electronic cash registers, was supported by the appearance of adequate software products. These products permitted the building of complex networks of PC and cash registers at incomparably lower relative prices for supermarkets, hotels and restaurants. During the next several years, the range of company products has expanded with electronic scales, working in conjunction with a cash register and label printer; POLE display, fiscal, "kitchen", label and ESC / POS printers; a portable cash register and an item server, plus a number of new program products. In 2001 was developing and introduced Total Quality Management System responded on ISO 9001:2000. In the end of 2001 DATECS Ltd. fulfilled requirements on the standard ISO 9001:2000 and passed successfully the certification. The range on Quality System Management has included all activities on the company connected with Design and Manufacture of Cash Registers, Digital Scales, Printers, POS Related Equipment, PCB Assembly and GIS Software delivery. Installation an dintegration of software solutions. Data conversion services.